The Brompton (folding bike) has come into its own this week. We had a bit of anticyclonic Indian Summer, with no wind, lots of sun, blue skies, colourful trees & pleasant (12°C) temperatures. Actually, I find even 12°C too cold for "normal" cycling as I sweat going uphill then freeze going back down again. No doubt there are high-tech clothes which can deal with that, but I don't have them. On the other hand, I find it simple to wear enough to keep warm on the flat. Especially wearing my rucksack on the front as a wind-break. Anyway, that's why I look for flattish places to ride, especially when it's cold. 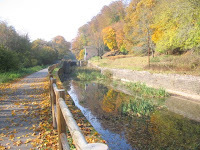 Which rules out starting & finishing at home, but leaves lots of possible trips along canals & disused railways, cheating by taking the bike there & back by car. 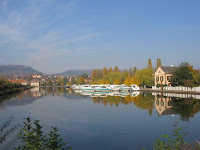 A good ride on Thursday started in Saverne, leaving the car in the free car park opposite the (now out of season, but still picturesque) marina. When walking, we usually have to leave the car in isolated lay-bys or clearings, which always seems like asking for trouble, but with the bike it is easier to find a near-enough busy car-park. 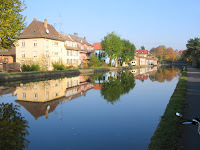 From there, you can hardly fail to follow the Marne-Rhine canal up to the surprisingly-deep & usually-busy lock in the town centre & westwards to Lutzelbourg (if you come to Strasbourg, you went the wrong way). There are good views if you climb to Lutzelbourg Castle, which is in ruins but is being extensively tidied up. I gave them a miss this time on my flat ride. There were plenty of good views at ground level. 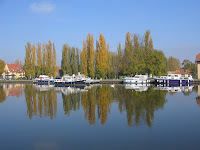 Particularly brightly-coloured boats & trees reflected in calm canal water. Next stop after Lutzelbourg, on our usual car-tourist-visitor trip, is the famous "Inclined Plane" boat lift at Arzviller. This is the short-&-sharp method for boats to deal with the Col de Saverne. But on a bike, you get the option of following the previous (now derelict) canal as it winds gently up through 17 now-gateless locks with 17 mostly-deserted lock-keeper's cottages. Only 45 metres climb on 4 km of well-surfaced track (important with little Brompton wheels) brings you up to the level of the top of the inclined plane. Apparently, before the inclined plane was opened in 1969, that used to take all day in a barge. 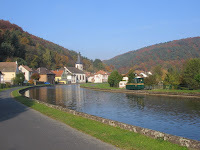 At the bottom, you are on the canal-side cycle-track back to Saverne again.